Thomas the Apostle (Biblical Hebrew: תומאס הקדוש‎; Ancient Greek: Θωμᾶς; Coptic: ⲑⲱⲙⲁⲥ; Classical Syriac: ܬܐܘܡܐ ܫܠܝܚܐ‎ Ṯaumā s̲h̲liḥā (Thoma Sheliha); also called Didymus ("twin"), was one of the Twelve Apostles of Jesus according to the New Testament. Thomas is informally referred to as "Doubting Thomas" because he doubted Jesus' resurrection when first told (in the Gospel of John account only), followed later by his confession of faith, "My Lord and my God," on seeing Jesus' wounded body. Traditionally, Thomas is believed to have travelled outside the Roman Empire to preach the Gospel, travelling as far as Tamilakam which are the states of Kerala and Tamil Nadu in present-day India. According to tradition, Thomas reached Muziris, (modern-day North Paravur and Kodungalloor in the state of Kerala, India) in AD 50 and converted several people, founding what today are known as Saint Thomas Christians or Mar Thoma Nazranis. After his death, the reputed relics of Saint Thomas the Apostle were enshrined as far as Mesopotamia in the 3rd century, and later moved to various places. 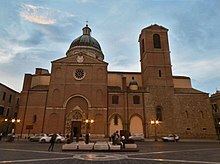 In 1258, some of the relics were brought to Ortona, in Abruzzo, Italy, where they have been held in the Church of Saint Thomas the Apostle. 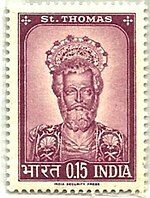 He is often regarded as the Patron Saint of India, and the name Thoma remains quite popular among Saint Thomas Christians of India. Thomas speaks again in John 14:5. There, Jesus had just explained that he was going away to prepare a heavenly home for his followers, and that one day they would join him there. Thomas reacted by saying, "Lord, we know not whither thou goest; and how can we know the way?" John 20:24–29 tells how doubting Thomas was skeptical at first when he heard that Jesus had risen from the dead and appeared to the other apostles, saying, "Except I shall see on his hands the print of the nails, and put my finger into the print of the nails, and thrust my hand into his side, I will not believe." But when Jesus appeared later and invited Thomas to touch his wounds and behold him, Thomas showed his belief by saying, "My Lord and my God". Jesus then said, "Thomas, because thou hast seen me, thou hast believed: blessed [are] they that have not seen, and [yet] have believed." The name Thomas (Koine Greek: Θωμᾶς) given for the apostle in the New Testament is derived from the Aramaic or Classical Syriac: ܬܐܘܡܐ‎ Taumā/Toma, equivalently from Hebrew Teom, meaning "twin". The equivalent term for twin in Greek, which is also used in the New Testament, is Δίδυμος Didymos. The Nag Hammadi copy of the Gospel of Thomas begins: "These are the secret sayings that the living Jesus spoke and Didymos, Judas Thomas, recorded." Early Syrian traditions also relate the apostle's full name as Judas Thomas. Some have seen in the Acts of Thomas (written in east Syria in the early 3rd century, or perhaps as early as the first half of the 2nd century) an identification of Saint Thomas with the apostle Judas, Son of James, better known in English as Jude. However, the first sentence of the Acts follows the Gospels and the Acts of the Apostles in distinguishing the apostle Thomas and the apostle Judas son of James. Others, such as James Tabor, identify him as Judah, the brother of Jesus mentioned by Mark. In the Book of Thomas the Contender, part of the Nag Hammadi, he is alleged to be a twin to Jesus: "Now, since it has been said that you are my twin and true companion, examine yourself…"
A "Doubting Thomas" is a skeptic who refuses to believe without direct personal experience—a reference to the Apostle Thomas, due to his refusal to believe the resurrected Jesus had appeared to the ten other apostles, until he could see and feel the wounds received by Jesus on the cross. When the feast of Saint Thomas was inserted in the Roman calendar in the 9th century, it was assigned to 21 December. 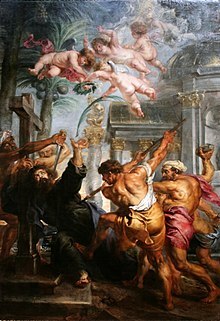 The Martyrology of St. Jerome mentioned the apostle on 3 July, the date to which the Roman celebration was transferred in 1969, so that it would no longer interfere with the major ferial days of Advent. 3 July was the day on which his relics were translated from Mylapore, a place along the coast of the Marina Beach, Chennai (Madras) in India, to the city of Edessa in Mesopotamia. Traditionalist Roman Catholics (who follow the General Roman Calendar of 1960 or earlier) and many Anglicans (including members of the Episcopal Church as well as members of the Church of England and the Lutheran Church, who worship according to the 1662 edition of the Book of Common Prayer), still celebrate his feast day on 21 December. However, most modern liturgical calendars (including the Common Worship calendar of the Church of England) prefer 3 July. The Eastern Orthodox and Byzantine Catholic churches celebrate his feast day on 6 October (for those churches which follow the traditional Julian calendar, 6 October currently falls on 19 October of the modern Gregorian calendar). In addition, the next Sunday of the Easter (Pascha) is celebrated as the Sunday of Thomas, in commemoration of Thomas' question to Jesus, which led him to proclaim, according to Orthodox teaching, two natures of Jesus, both human and divine. Thomas is commemorated in common with all of the other apostles on 30 June (13 July), in a feast called the Synaxis of the Holy Apostles. He is also associated with the "Arabian" (or "Arapet") icon of the Theotokos (Mother of God), which is commemorated on 6 September (19 September). The Malankara Orthodox church celebrates his feast on three days, 3 July (in memory of the relic translation to Edessa), 18 December (the Day he was lanced), and 21 December (when he died). Map of ancient Silk Road and Spice Route. Thomas is traditionally believed to have sailed to India in AD 50 (but there is evidence of his being in Taxila in AD 43, where he did not have success) to spread the Christian faith, and is believed to have landed at the port of Muziris, (modern-day North Paravur and Kodungalloor in modern-day Kerala state) where there was a Jewish community at the time. The port was destroyed in 1341 by a massive flood that realigned the coasts. He is believed by the Saint Thomas Christian tradition to have established seven churches (communities) in Kerala. These churches are at Kodungallur, Palayoor, Kottakkavu (Paravur), Kokkamangalam, Niranam, Nilackal (Chayal), Kollam and Thiruvithamcode (half church). Thomas baptized several families, namely Pakalomattom, Sankarapuri, Thayyil, Payyappilly, Kalli, Kaliyankal, Pattamukku. Other families claim to have origins almost as far back as these and the religious historian Robert Eric Frykenberg notes that "Whatever dubious historicity may be attached to such local traditions, there can be little doubt as to their great antiquity or to their great appeal in popular imagination". —  Hymns of Saint Ephrem, edited by Lamy (Ephr. Hymni et Sermones, IV). —  quoted in Medlycott 1905, ch. ii. According to Eusebius' record, Thomas and Bartholomew were assigned to Parthia and India. The Didascalia (dating from the end of the 3rd century) states, "India and all countries condering it, even to the farthest seas... received the apostolic ordinances from Judas Thomas, who was a guide and ruler in the church which he built." Moreover, there is a wealth of confirmatory information in the Syriac writings, liturgical books, and calendars of the Church of the East, not to mention the writings of the Fathers, the calendars, the sacramentaries, and the martyrologies of the Roman, Greek and Ethiopian churches. Fear not, Thomas. Go away to India and proclaim the Word, for my grace shall be with you." But the Apostle still demurred, so the Lord overruled the stubborn disciple by ordering circumstances so compelling that he was forced to accompany an 'Indian' merchant, Abbanes, as a slave to his native place in northwest 'India', where he found himself in the service of the Indo-Parthian king, Gondophares. According to the Acts of Thomas, the apostle's ministry resulted in many conversions throughout the kingdom, including the king and his brother. Aside from a small remnant of the Church of the East in Kurdistan, the only other church to maintain a distinctive identity is the Saint Thomas Christian congregations along the Kerala in southwest India. According to the most ancient tradition of this church, Thomas evangelized this area and then crossed to the Coromandel Coast of southeast India, where, after carrying out a second mission, he died at Chennai. Throughout the period under review, the church in India was under the jurisdiction of Edessa, which was then under the Mesopotamian patriarchate at Seleucia-Ctesiphon and later at Baghdad and Mosul. Historian Vincent A. Smith says, "It must be admitted that a personal visit of the Apostle Thomas to South India was easily feasible in the traditional belief that he came by way of Socotra, where an ancient Christian settlement undoubtedly existed. I am now satisfied that the Christian church of South India is extremely ancient...". Thomas is believed to have left northwest India when invasion threatened and traveled by vessel to the Malabar Coast, possibly visiting southeast Arabia and Socotra en route, and landing at the former flourishing port of Muziris (modern-day North Paravur and Kodungalloor) (c. 50 AD) in the company of a Jewish merchant Abbanes (Hebban). From there he is said to have preached the gospel throughout the Malabar coast. The various churches he founded were located mainly on the Periyar River and its tributaries and along the coast, where there were Jewish colonies. In accordance with apostolic custom, Thomas ordained teachers and leaders or elders, who were reported to be the earliest ministry of the Malabar Church. According to Syrian Christian tradition, Saint Thomas was allegedly killed at St.Thomas Mount, in Chennai, in 72 A.D July 3rd. and his body was interred in Mylapore. Ephrem the Syrian states that the Apostle was martyred in India, and that his relics were taken then to Edessa. This is the earliest known record of his martyrdom. According to Kurt E. Koch, Thomas the Apostle possibly travelled into Indonesia via India with Indian traders. ..The Warlord (Cacique) said to me: "We don't need for priests, because Holy Father Thomé (Thomas the Apostle) walked on our homeland himself, and he taught us about the Truth, praying for us in the name of Jesus Christ. —  Quoted by Martin Dobrizhoffer: "Geschichte der Abiponer: eine berittenen und kriegerischen Nation in Paraquay", Volume 3, ch.II. Vienna (1784). Dobrizhoffer believed that it was "almost impossible" for that legend to be truthful, although "with the guidance of the Almighty Power of God", there was a chance for Thomas the Apostle to have arrived in Paraguayan lands. ...The paraguayan tribes they have this very curious tradition. They claim that a very holy man (Thomas the Apostle himself), whom they call "Paí Thome", lived amongst them and preached to them the Holy Truth, wandering and carrying a wooden cross on his back. —  Quoted by Antonio Ruiz de Montoya: Conquista espiritual hecha por los religiosos de la Compañía de Jesús en las provincias del Paraguay, Paraná, Uruguay y Tape", Chapter XVIII. Madrid (1639). Despite all these legends and traditions, no credible evidence exists about Saint Thomas the Apostle and his alleged journey to Paraguay and neighboring lands. The sole recorded research done about the subject was during José Gaspar Rodríguez de Francia's reign after the Independence of Paraguay. This is mentioned by Franz Wisner von Morgenstern, an Austro-Hungarian engineer who served in the Paraguayan armies prior and during the Paraguayan War. According to Von Morgenstern, some Paraguayan miners while working nearby some hills at the Caaguazú Department found some stones with ancient letters carved in them. Dictator Francia sent his finest experts to inspect those stones, and they concluded that the letters carved in those stones were Hebrew-like symbols, but they couldn't translate them nor figure out the exact date when those letters were carved. No further recorded investigations exists, and according to Wisner, people believed that the letters were made by Saint Thomas the Apostle, following the tradition. Traditional accounts say that the Apostle Thomas preached not only in Kerala but also in other parts of Southern India – and a few relics are still kept at San Thome Basilica in Chennai, Mylapore, India. Marco Polo, the Venetian traveller and author of Description of the World, popularly known as Il Milione, is reputed to have visited Southern India in 1288 and 1292. The first date has been rejected as he was in China at the time, but the second date is generally accepted. He also stopped at Quilon (Kollam) on the western Malabar Coast of India, where he met Syrian Christians and recorded their tradition of Saint Thomas and his tomb on the eastern Coromandel Coast of the country. Il Milione, the book he dictated on his return to Europe, was on its publication condemned by the Church as a collection of impious and improbable traveller's tales. It became very popular reading in medieval Europe and inspired Spanish and Portuguese sailors to seek out the fabulous (and possibly Christian) India described in it. According to Saint Theodoret of Cyrrhus, the bones of Saint Thomas were transferred by Cyrus, Bishop of Edessa, from the martyrium outside of Edessa to a church in the south-west corner of the city on 22 August 394. The reputed relics of St. Thomas remained at Edessa until they were translated to Chios in 1258. Some portion of the relics were later transported to the West, and now rest in the Cathedral of St. Thomas the Apostle in Ortona, Italy. However, the skull of Thomas is said to be at Monastery of Saint John the Theologian on the Greek island of Patmos. Ortona's three galleys reached the island of Chios in 1258, led by General Leone Acciaiuoli. Chios was considered the island where Saint Thomas, after the martyrdom in India, had been buried. A portion fought around the Peloponnese and the Aegean islands, the other in the sea lapping at the then Syrian coast. The three galleys of Ortona moved on the second front of the war and reached the island of Chios. The tale is provided by Giambattista De Lectis, physician and writer of the 16th century of Ortona. After the looting, the navarca Ortona Leone went to pray in the main church of the island of Chios and was drawn to a chapel adorned and resplendent with lights. An elderly priest, through an interpreter informed him that in that oratory was venerated the Body of Saint Thomas the Apostle. Lion, filled with an unusual sweetness, gathered in deep prayer. At that moment a light hand twice invited him to come closer. The navarca Leone reached out and took a bone from the largest hole of the tombstone, on which were carved the Greek letters and a halo depicted a bishop from the waist up. He was the confirmation of what he had said the old priest and that you are indeed in the presence of the Apostle's body. He went back on the galley and planned the theft for the next night, along with fellow Ruggiero Grogno. They lifted the heavy gravestone and watched the underlying relics. The wrapped in snow-white cloths them laid in a wooden box (stored at Ortona to the looting of 1566) and brought them aboard the galley. Lion, then, along with other comrades, he returned again in the church, took the tombstone and took her away. Just the Chinardo admiral was aware of the precious cargo moved all the sailors of the Muslim faith on other ships and ordered him to take the route to Ortona. He landed at the port of Ortona 6 September 1258. According to the story of De Lectis, he was informed the abbot Jacopo responsible for Ortona Church, which predispose full provision for hospitality felt and shared by all the people. 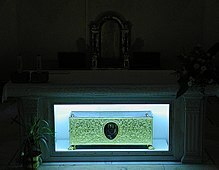 Since then the body of the apostle and the gravestone are preserved in the crypt of the Basilica. In 1259 a parchment written in Bari by the court under John Peacock contracts, the presence of five witnesses, preserved in Ortona at the Diocesan Library, confirming the veracity of that event, reported, as mentioned, by Giambattista De Lectis, physician and writer Ortona of the 16th century. The relics resisted both the Saracen looting of 1566, and the destruction of the Nazis in the famous battle of Ortona fought in late December 1943. The basilica was blown up because the belfry was considered a lookout point by the allies, coming by sea from San Vito Chietino. The relics, together with the treasure of Saint Thomas, were intended by the Germans to be sold, but the monks entombed them inside the bell tower, the only surviving part of the semi-ruined church. The tombstone of Thomas, brought to Ortona from Chios along with the relics of the Apostle, is currently preserved in the crypt of St Thomas Basilica, behind the altar. The urn containing the bones instead is placed under the altar. It is the cover of a fake coffin, fairly widespread burial form in the early Christian world, as the top of a tomb of less expensive material. The plaque has an inscription and a bas-relief that refer, in many respects, to the Syro-Mesopotamian. Tombstone Thomas the Apostle on inclusion can be read, in Greek characters uncial, the expression 'osios thomas, that Saint Thomas. 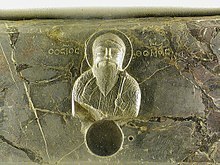 It can be dated from the point of view palaeographic and lexical to the 3rd–5th century, a time when the term osios is still used as a synonym of aghios in that holy is he that is in the grace of God and is inserted in the Church: the two vocabulary, therefore, indicate the Christians. In the particular case of Saint Thomas' plaque, then, the word osios can easily be the translation of the word Syriac mar (Lord), attributed in the ancient world, but also to the present day, is a saint to be a bishop. The finger bones of Saint Thomas were discovered during restoration work at the Church of Saint Thomas in Mosul, Iraq in 1964, and were housed there until the Fall of Mosul, after which the relics were transferred to the Monastery of Saint Matthew on 17 June 2014. A number of early Christian writings written during the centuries immediately following the first Ecumenical Council of 325 mention Thomas' mission. The main source is the apocryphal Acts of Thomas, sometimes called by its full name The Acts of Judas Thomas, written circa 180–230 AD/CE, These are generally regarded by various Christian religions as apocryphal, or even heretical. The two centuries that lapsed between the life of the apostle and the recording of this work cast doubt on their authenticity. According to the text, following the Ascension, the Apostles cast lots as to where each should go and Thomas drew India. A man named Habban recruited (or enslaved) Thomas to work as a builder and architect, on behalf of king Gondophares, the ruler of the Indo-Parthian Kingdom. The journey to India is described in detail. After a long period working at the royal court at ancient Taxila, Thomas ordained leaders for a church there. According to some accounts, Vasudeva I, Kushan emperor circa 191 to 232 AD/CE, reputedly repatriated the bones of Thomas from Mylapore to Edessa. 3rd century (185–254? ), quoted in Eusebius; Church represented: Alexandrian/ Greek Biographical. Christian Philosopher, b-Egypt, Origen taught with great acclaim in Alexandria and then in Caesarea. He is the first known writer to record the casting of lots by the Apostles. Origen's original work has been lost, but his statement about Parthia falling to Thomas has been preserved by Eusebius. "Origen, in the third chapter of his Commentary on Genesis, says that, according to tradition, Thomas's allotted field of labour was Parthia". 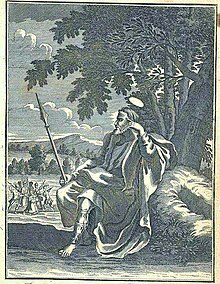 Ephrem: 4th century; Church Represented: Syrian Biographical  Many devotional hymns composed by St. Ephraem bear witness to the Edessan Church's strong conviction concerning St. Thomas's Indian Apostolate. There the devil speaks of Saint Thomas as "the Apostle I slew in India". Also "The merchant brought the bones" to Edessa. Another hymn eulogizing Saint Thomas reads "The bones the merchant hath brought". "In his several journeyings to India/ And thence on his return/ All riches/ which there he found/ Dirt in his eyes he did repute when to thy sacred bones compared". In yet another hymn Ephrem speaks of the mission of Thomas: "The earth darkened with sacrifices' fumes to illuminate", "a land of people dark fell to thy lot", "a tainted land Thomas has purified"; "India's dark night" was "flooded with light" by Thomas. Gregory of Nazianzus: 4th century (died 389); Church Represented: Alexandrian. Biographical Note: Gregory of Nazianzus was born AD 330, consecrated a bishop by his friend St. Basil; in 372 his father, the Bishop of Nazianzus, induced him to share his charge. In 379 the people of Constantinople called him to be their bishop. By the Orthodox Church he is emphatically called "the Theologian". "What? were not the Apostles strangers amidst the many nations and countries over which they spread themselves? … Peter indeed may have belonged to Judea; but what had Paul in common with the gentiles, Luke with Achaia, Andrew with Epirus, John with Ephesus, Thomas with India, Mark with Italy?" 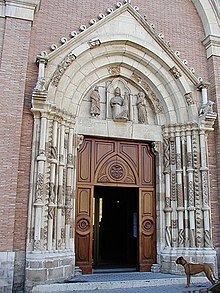 4th century (died 397); Church Represented: Western. Biographical Note: Saint Ambrose was thoroughly acquainted with the Greek and Latin Classics, and had a good deal of information on India and Indians. He speaks of the Gymnosophists of India, the Indian Ocean, the river Ganges etc., a number of times. "This admitted of the Apostles being sent without delay according to the saying of our Lord Jesus… Even those Kingdoms which were shut out by rugged mountains became accessible to them, as India to Thomas, Persia to Matthew..."
Saint Gregory of Tours (died 594) Saint Gregory's testimony: "Thomas the Apostle, according to the narrative of his martyrdom is stated to have suffered in India. His holy remains (corpus), after a long interval of time, were removed to the city of Edessa in Syria and there interred. In that part of India where they first rested, stand a monastery and a church of striking dimensions, elaborately adorned and designed. This Theodore, who had been to the place, narrated to us." Besides the Acts of Thomas there was a widely circulated Infancy Gospel of Thomas probably written in the later 2nd century, and probably also in Syria, which relates the miraculous events and prodigies of Jesus' boyhood. This is the document which tells for the first time the familiar legend of the twelve sparrows which Jesus, at the age of five, fashioned from clay on the Sabbath day, which took wing and flew away. The earliest manuscript of this work is a 6th-century one in Syriac. This gospel was first referred to by Irenaeus; Ron Cameron notes: "In his citation, Irenaeus first quotes a non-canonical story that circulated about the childhood of Jesus and then goes directly on to quote a passage from the infancy narrative of the Gospel of Luke. Since the Infancy Gospel of Thomas records both of these stories, in relative close proximity to one another, it is possible that the apocryphal writing cited by Irenaeus is, in fact, what is now known as the Infancy Gospel of Thomas. Because of the complexities of the manuscript tradition, however, there is no certainty as to when the stories of the Infancy Gospel of Thomas began to be written down." In the 16th-century work Jornada, Antonio Gouvea writes of ornate crosses known as Saint Thomas Crosses. It is also known as Nasrani Menorah or Mar Thoma Sleeva. 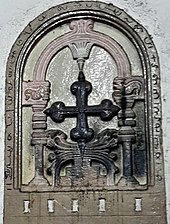 These crosses are believed to date from the 6th century as per the tradition and are found in a number of churches in Kerala, Mylapore and Goa. Jornada is the oldest known written document to refer to this type of cross as a St. Thomas Cross. Gouvea also writes about the veneration of the Cross at Cranganore, referring to the cross as "Cross of Christians". It is widely perceived as the symbol of Saint Thomas Christians. There are several interpretations of the Nasrani symbol. The interpretation based on Christian Jewish tradition assumes that its design was based on Jewish menorah, an ancient symbol of the Hebrews, which consists of seven branched lamp stand (candelabra). The interpretation based on local culture states that the Cross without the figure of Jesus and with flowery arms symbolizing "joyfulness" points to the resurrection theology of Saint Paul; the Holy Spirit on the top represents the role of Holy Spirit in the resurrection of Jesus Christ. The lotus symbolizing Buddhism and the Cross over it shows that Christianity was established in the land of Buddha. The three steps indicate Calvary and the rivulets, channels of Grace flowing from the Cross. ^ "Ramban Pattu by maliekal Thoma Ramban"
^ "Elements of Syro Malabar History by Koonammakkal Thoma Kathanar, P.15"
^ a b c The Encyclopedia of Christianity, Volume 5 by Erwin Fahlbusch. Wm. B. Eerdmans Publishing – 2008. p. 285. ISBN 978-0-8028-2417-2. ^ "Liturgical Calendar: December'". 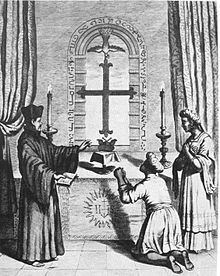 Latin-mass-society.org. Archived from the original on 5 February 2012. Retrieved 25 April 2010. ^ A. E. Medlycott, (1905) "India and the Apostle Thomas"; Gorgias Press LLC; ISBN 1-59333-180-0. ^ Thomas Puthiakunnel, (1973) "Jewish colonies of India paved the way for St. Thomas", The Saint Thomas Christian Encyclopedia of India, ed. George Menachery, Vol. II. ^ "The apostle: saint thomas". www.catholictradition.org. Retrieved 26 September 2015. ^ "Patron Saints of Countries". Retrieved 10 May 2015. ^ "Indian Christianity". Retrieved 10 May 2015. ^ "... Judas Thomas, as he is called [in the Acta Thomae] and elsewhere in Syriac tradition ...". "St. Thomas the Apostle" . Catholic Encyclopedia. 1913. ^ "Propers for St. Thomas the Apostle". Commonprayer.org. Retrieved 25 April 2010. ^ "Apostle Thomas". Retrieved 10 May 2015. ^ "Malankara Orthodox Church". Retrieved 10 May 2015. ^ "The Passing of Mary". Ccel.org. 1 June 2005. Retrieved 25 April 2010. ^ Norman, Diana (1993). "In imitation of Saint Thomas Aquinas: art, patronage and liturgy within a Renaissance chapel". Renaissance Studies. 7: 1–42. doi:10.1111/j.1477-4658.1993.tb00266.x. ^ MEDLYCOTT, India and the Apostle St. Thomas (London, 1905). Fully reproduced in ICHC I, "The Nazranies", ed. George Menachery, 1998, pp.157 ff. ^ "Thomas The Apostole". Stthoma.com. Archived from the original on 8 February 2011. Retrieved 25 April 2010. ^ Farmer, David (2011). The Oxford Dictionary of Saints, Fifth Edition Revised. Oxford University Press. p. 418. ISBN 978-0-19-959660-7. ^ "Ser Marco Polo; notes and addenda to Sir Henry Yule's edition, containing the results of recent research and discovery". Internet Archive. Retrieved 10 May 2015. ^ a b Hunter, William Wilson (1886). The Indian empire : its peoples, history, and products. Morrison & Gibb. ^ Neill, Stephen (2004). A History of Christianity in India: The Beginnings to AD 1707. Cambridge University Press. p. 29. ^ ""Llegada a América del Apóstol Santo Tomás". Excerpts in Spanish about Dobrizhoffer's analysis about Thomas the Apostle and his legendary journey into Paraguay, based on his "Account on the Abipones"". ^ Antonio Ruíz de Montoya: "Conquista espiritual hecha por los religiosos de la Compañia de Iesus, en las prouincias del Paraguay, Parana, Vruguay y Tape". Madrid, Imprenta del Reino (1639). ^ Franz Wisner von Morgenstern: El Dictador del Paraguay: José Gaspar de Francia (in Spanish), page 198. Published by Instituto Paraguayo Alemán – Asunción, Paraguay (1998) – ISBN 978-9000080663. ^ a b Madras Rediscovered by S. Muthiah (2014), East-West Press. ISBN 978-93-85724-77-0. ^ "The Pilgrimage of S. Silvia of Aquitania to the Holy Places". Retrieved 10 May 2015. ^ a b J.B. Segal, Edessa 'the Blessed City, Gorgias Press LLC, 2005, ISBN 1-59333-059-6, pp. 174–176, 250. ^ John Sanidopoulos. "MYSTAGOGY". Retrieved 10 May 2015. ^ Arraf, Jane (31 March 2018). "Iraq's Christians Remain Displaced This Easter". NPR. Retrieved 18 May 2018. ^ "Holy Relics of Saint Thomas transferred to the Monastery of St Matthew in Nineveh". OCP. 9 July 2014. Retrieved 18 May 2018. ^ Dr. Wright (Ed. ), Apocryphal Acts of the Apostles, London, 1871 (Syriac Text in Vol.1, English translation in Vol. II); Rev. Paul Bedjan, Acta Martyrum et Sanctorum, Vol. III, Leipsic-Paris, 1892.A. E. Medlycott, India and the Apostle Thomas, London 1905, Appendix, pp. 221–225. Also in The Nazranies, Ed. G. Menachery, Ollur, 1998. ^ "The Consummation of Thomas the Apostle". Retrieved 10 May 2015. ^ "Acts of St. Thomas". Gnosis.org. Retrieved 25 April 2010. ^ Greek Satrap of Indus Valley. Books.google.co.in. 1966. ISBN 978-81-208-0405-0. Retrieved 25 April 2010. ^ Cardinal Mai, Scriptorum Veterum Nova Collectio, Rome, 1838. W. Cureton, Ancient Syriac Documents, London, 1864: Latin Translation by A. Assemani; Vindobonae, 1856; Didascalia in Coptic, Ethiopic, and Arabic. Also see Medlycott, p. 33 ff. ^ (Cureton, pp. 32, 33, 34). 20th Century Discussions: Medlycott, pp 33–37 alias Menachery, STCEI, II, 20–21, Farquhar, p. 26 ff. ^ Eusebius, Historia Ecclesiastica, 3.1; Patrologia Graeca, Migne Edn., 20.215; Patrologia Latina, Migne, 21.478. ^ Patrologia Graeca (Migne), 19–24., 20.215. ^ J.C. Panjikaran, Christianity in Malabar w.s.r.t. The St. Thomas Christians of the Syro-Malabar Rite, Orientalia Christiana, VI, 2 (23), Roma I, April 1926, p.99 esp. for reference to Pantaenus' Indian visit. Reproduced in ICHC I 'The Nazranies", ed. George Menachery 1998, pp.277 ff. ^ Bickell, S. Ephraemi Syri, Caramina Nisibena, Lipsiae, 1866; Monsignor Lamy, S. Ephraemi Syri Hymni et Sermones, (Quarto 4 vols. ); Breviary acc. to the Rite of the Church of Antioch of the Syrians, Mosul, 1886–96. Also See Medlycott, pp. 21–32. Alias Menachery (Ed.) STCEI, II, p. 18 ff. ^ 20th Century Discussions : Medlycott, pp.21–32 alias Menachery (Ed. ), STCEI, II, p. 18 ff. ^ Homil. XXXII, xi, Contra Arianos et de seipso. Migne, PG 36-228. ^ 20th Century Discussions : Medlycott, pp, 42,43; Perumalil pp. 43,44. ^ 20th Century Discussions : Medlycott, pp. 43, 44. Perumalil, pp. 44.45, Perumalil and Menachery (STCEI I, II), Migne Edns. ; Wm. A. Jurgens, Faith of the Early Fathers:etc. History of Christianity-Source Materials by M. K. George, CLS, Madras, 1982 and the Handbook of Source Materials by Wm. G. Young.D. Ferroli, The Jesuits in Malabar, Vol. I. Bangalore, 1939, esp. notes and documents p. 71 ff. ; W.S. Hunt, The Anglican Church in Travancore and Cochin, Kottayam, 1920, esp. p. 27, p.33 pp. 46–50; G.T. Mackenzie, i.c.s., "History of Christianity in Travancore", in The Travancore State Manual, Vol-II, Edited by Nagam Aiya, Trivandrum 1906 pp. 135–233; Menachery, STCEI, I, II. Harvey, Susan Ashbrook (2005). "Julian Saba and Early Christianity". Wilderness: Essays in Honour of Frances Young. A&C Black. pp. 120–134. George Menachery, Ed., The St.Thomas Christian Encyclopaedia of India, esp. Vol.2, 1973. George Menachery, Ed., The Nazranies, Indian Church History Classics, Vol.1, 1998, esp.books fully reproduced in it by Mackenzie, Medlycott, Farquar& many others. Glenn W. Most, Doubting Thomas. Cambridge, Mass., London: Harvard University Press, 2005 (a study in the reception of Thomas' story in literature and art). Pierre Perrier and Walter Xavier. Thomas Fonde L'église En Chine (65–68 Ap J.-C.). (Paris: Jubilé, 2008). ISBN 9782866794828.